Find a movement practice you love. This Fall at Aikido Multnomah Aikikai we offer several options to “dip your toe in the water” or jump into practice fully. Register for one-day events on our Eventbrite page. Register for class series through our website registration page. Note, All public events listed above are open to Regular Adult dojo members. Become a Regular Adult Member and participate in any or all of these public events for no additional cost. Practice unlimited number of regular aikido classes per month. View the regular weekly class schedule. The dictionary defines balance as "the ability to move or to remain in a position without losing control or falling.” This is probably the best definition to describe what happened to me. 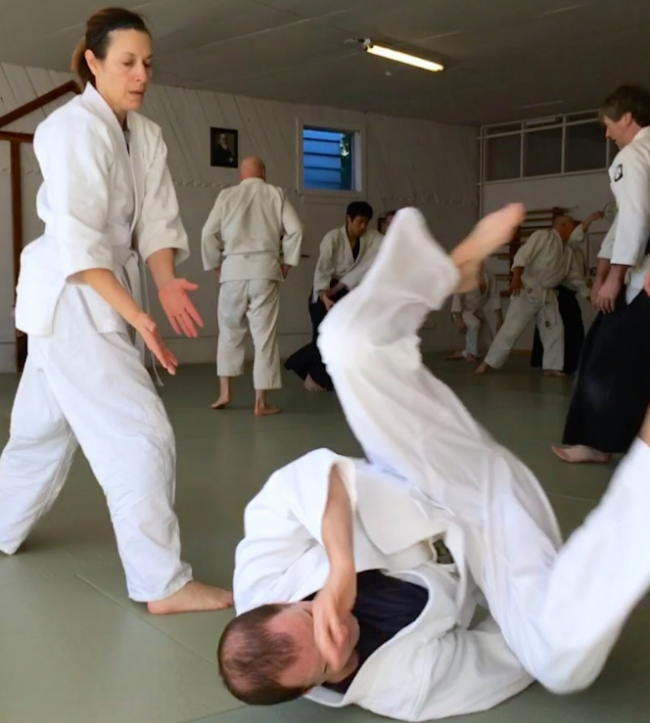 Shortly after joining the dojo (Aikido Multnomah Aikikai, in Portland Oregon), Suzane Van Amburgh Sensei held several Saturday workshops on ”How to fall”. These sessions included instruction on how to keep your balance and how to fall safely. Well, I attended several of these workshops just to gain knowledge on the subject. They were very informative and you got to practice keeping your balance while learning how to fall safely. Suzane Sensei made it fun and safe under her watch full eye. At the age of 70, like me, one needs to be very careful with falls, which can lead to being immobilized temporary or permanently. Knowing this, I have been practicing keeping my balance and falling safely. Last week, stepping off a curb, I lost my footing while skidding on a stone, twisted my leg and found myself heading for the concrete pavement. Suddenly, all that practice kicked in! I kept my balance, not just once, but a second time, and never saw the ground. Thank you Suzane Sensei! My only injury was some pulled ligaments. Then I thought, lucky I attended these “How to fall" workshops. The result could not have come out better. There is a tradition in the Japanese martial arts of training intensively for a period of time in the coldest part of the winter: "winter keiko"
January Winter Intensive is a time to renew your resolve to practice, to warm up your internal engine in the cold of winter, to come together with your fellow dojo members and support each other in taking a significant jump in progress. This year's theme is Sense What’s Behind You. I invite you to consider the meaning both literally and figuratively. Sense what you’ve come through and come to in your life. How has your history brought you to the opportunity now before you? What is coming to completion? What are you grateful for? Consider lineage. Who has come before you and who is coming up behind you. What is your responsibility to your sempai and your kohai. What is behind you can also refer to something that’s hidden from you (ura), something you are unaware of, yet is nearby. I invite you to set your intention to become aware of something you've been unaware of. On the mat, we’ll study ushiro waza and koshinage providing you with the opportunity to sense the position of uke behind you. In ukemi, I invite you to sense the space behind you, the shape of your spine as nage leads you, the shape of the space as you reach for the ground and take your roll or slide in for a pin. Ushiro waza includes ushiro ryotedori, ryokatadori, eridori, kubishime, hijitori. These attacks from behind offer the opportunity to develop a keen sense of what’s behind you and how to shift position to lead uke clearly. The accelerated motion of ushiro waza allows you to warm up your center, sweat, get a good work-out and feel your internal heat meet the cold winter air as you exit the dojo. Koshinage offers the study of sensing the space behind you and positioning uke clearly for the hip throw. Ura techniques provide opportunity to set intention to enter into uke’s blind spot. All of these practices offer opportunities to improve ukemi and maintain clear connection with nage. The new year is an excellent time to renew our commitment to training, look in the mirror (kagami), break our old habits (biraki) and resolve to improve ourselves. I invite you and challenge you to step up your training. In Japan, winter intensive is a time period when people resolve to practice everyday. This January, come to the dojo as much as you can and mark your attendance every day that you come in. At the end of the month we’ll recognize the members who trained the most. Thursdays, 6:15pm classes: intermediate level open to 4th kyu + above, Van Amburgh Sensei. Winter weather can be unpredictable and disrupt our plans. This month, let’s build our resilience and practice our adaptability. Specially scheduled events may need to be rescheduled or cancelled. Let’s improve our communication systems to keep each other informed and help each other out through the month. Check Upcoming Dates page if you’re wondering whether class is on. We’ll post a notification as soon as we make the determination. Please save the link and check often: http://tinyurl.com/aikidodates. We've changed how we manage dojo news and upcoming events to make it easier for us to manage and easier for you to use!